This video from last year gives a sense of where the new fire is. 3:08pm - Wakefield petrol stations are draining their fuel tanks incase the fire sweeps through. 2:44pm - Another fire has broken out on Walters Bluff near Nelson city. Newshub reporter Annabelle Tukia is with helicopter pilots who say helicopters are being redirected to the scene. Fire and Emergency staff are racing to scene. 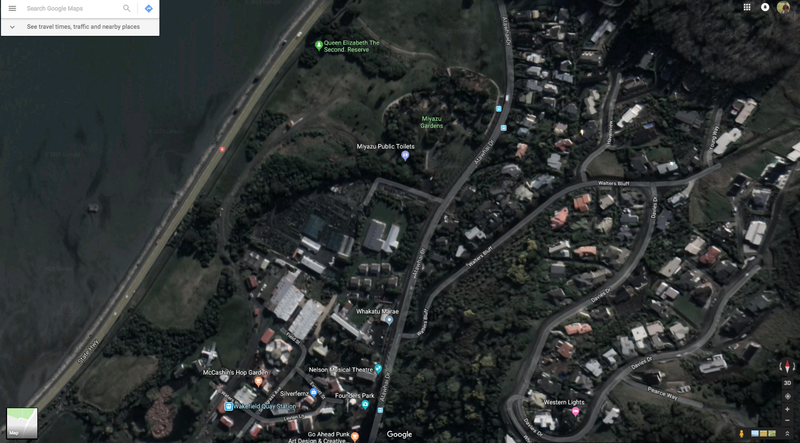 A number of resources that are fighting the fire in Pigeon Valley have been redirected to save houses in the line of fire on Walters Bluff. About six helicopters with monson fires are fighting the blaze, bucketing water out of the sea to try extinguish it. The bluff is a dry grassy area that is also a popular walking track through eucalyptus trees. 2:38pm - Wakefield resident Dawn Rosie told Newshub she hasn't been asked to evacuate yet but is following all instructions. "We're just wetting down the gutters in case any ash comes over, [make sure] there's no combustible stuff up there," she says. 2:13pm - At a media briefing, Emergency services and Civil Defence say they were prepared for this current situation and they have evacuated residents as a precautionary measure. Twelve hundred people from 240 homes are being evacuated from Wakefield at the moment, with 360 more properties in the wider area on stanby to leave when instructed. "The fire hasn't moved at any pace yet but that will certainly happen if this wind continues to develop," Fire and Emergency New Zealand incident controller John Sutton says. "The head of a fire is not a place to be. We don't put people there. Once it happens it's too late we haven't got that opportunity to go help people. Hopefully, the worst doesn't happen but we are prepared as much as we can. "We are working very very hard making firebreaks harder and aerial in the end its whether the wind is kind to us. Inspector Zane Hooper says it is 'quite possible' there will be further evacuations in the coming hours. The Wakefield welfare centre has been moved to the Saxton Stadium. Evacuated residents are asked to register, either by going to the centre or calling 03 543 8400. 2:05pm - Marlon Williams has had to postpone his concert at Neudorf Vineyard in Upper Moutere on Friday night until next Tuesday due to the fire. 1:22pm - Wakefield residents have been asked to evacuate. Richard Kirby of The Tasman District Council says the entire town of 2500 residents will be evacuated in stages. All residents north of State Highway 6 between Pigeon Valley Rd and Simmonds Rd will be evacuated first followed by the rest of the town. "The full town will be evacuated correct," he told Newshub. Residents are encouraged to stay with family and friends or to go to the Saxton Stadium welfare centre. Mr Kirby says the fire is currently around two and a half to three kilometres away from Wakefield. "The concern is a northerly wind is expected to kick off at 1pm and push the fire back. They have a trigger pint at Heaton Rd, it will probably be an hour down to Pigeon Valley for the fire and about three hours to the forest near the edge of Wakefield," Mr Kirby says. Mr Kirby expects it could take between four and six hours for all of Wakefield to evacuate. 1:17pm - The Nelson Cathedral is dedicating its 10am Sunday service to all those affected by the Pigeon Valley fire. 1pm - Agriculture Minister Damien O'Connor has pledged $50,000 to help farmers. "The wildfire and the drought conditions have combined to make it a particularly tough time for those trying to manage stock and grow food," Mr O'Connor says. Fifty thousand dollars of funding for the Rural Support Trusts and primary industry groups will help speed up the recovery of farming and horticultural businesses, he says. "The forecast holds little respite following several weeks of heat and high winds and with water restrictions in place, pastures and orchards are parched." The Ministry for Primary Industries is working with vets, the SPCA, Fire and Emergency and police to help farmers manage their animals or move them until it's safe to return. Following consultation with the Principal Rural Fire Officer, Nelson City Council is temporarily closing public access to further reserves and tracks. These precautions are necessary to support the emergency response to the fire in Tasman. The key risk is around the safety of people being caught should a fire break out. With the extremely dry conditions, prevailing winds, slope and nature of the vegetation, a fire would spread uphill extremely quickly, making evacuation very difficult. The Medical officer of Health has the following advice regarding the smoke from the Pigeon Valley Fire currently settling over the region. People with asthma, bronchitis, emphysema or other lung disease are at greatest risk from smoke inhalation. People with angina or other heart diseases might also be at greater risk. Remain indoors, close all the windows and doors, turn off ventilation, air conditioning and heating systems that draw in air from outside until the plume has dispersed or moved away, and you can no longer smell smoke. Keep up to date with the latest advice from Nelson Marlborough Public Health on their website. 12:40pm - One person has been admitted to Nelson Hospital with smoke related injuries. The man is in a stable condition. 12:20pm - Agriculture Minister Damien O'Connor is expected to make an announcement in support of farmers and growers in the Tasman area at 1pm. 12:05pm - Nelson is covered in thick smoke. A webcam shows the city slowly becoming covered in smoke throughout Friday. 11:50am - Pigeon Valley residents have been asked to evacuate due to weather conditions and heavy smoke. Residents were given early warning they may have to evacuate. People are asked to report to the Wakefield Civil Defence Centre or report to Civil Defence on 03 543 8400. 11:21am - The New Zealand Defence Force has deployed 63 personnel to help control the blaze. Commodore Tony Millar, the Acting Commander Joint Forces, says seven of the 33 NZDF personnel already in Nelson would continue working on Friday. "We are deploying 30 more personnel this morning to assist with a potential evacuation," Commodore Millar said. The number of personnel now assisting with the fire is 63. 11:18am - The Tasman District Council is warning people of the dangers of the smoke from the fire. Residents are asked to check the DHB website for the latest advice. Civil Defence Emergency Management Group Controller Dennis Bush-King says they have made the most of the favourable conditions on Thursday to contain the spread of the fire and build fire breaks. "However with a change in weather conditions predicted this afternoon residents in Wakefield have been given notice of potential evacuation. Our priority remains protecting people, their property and critical infrastructure." Temporary residents' access has been granted for a two-hour period to residents along Golden Hills Rd, to go back to their properties. They have the opportunity to collect essential belongings and to ensure their domestic animals are looked after and to check on stock. "The fire was pretty active overnight, particularly in areas in the southeast and northwest, and it’s now covering about 2000 hectares," Incident Controller John Sutton says. "We expect today to be similar to yesterday and it is likely that the fire will continue to burn over the weekend." 10:55am - NIWA has posted an update on the winds surrounding the fire. They expect 30-40kph north east winds on Friday afternoon. 10:53am - The Nelson SPCA is in desperate need of food due to extra animals arriving because of the fire. 10:24am - A Nelson B&B has opened it doors, making space for residents evacuated from their homes. 10:01am- A makeshift emergency food centre has been set up to help feed firefighters. 9:48am - Taranaki pilot Alan Beck, one of the helicopter pilots fighting the blaze, was called to help fight the inferno on Tuesday evening. "It was going to be a devastating fire, no question," he told Newshub. "As soon as we hit about the 15-mile mark from Nelson, we knew we were in for a hell of a fight. "We went onto the fire on Tuesday evening but really it was farting against thunder basically." More resources came but the fire continued to grow, Mr Beck says. Dense smoke is making it hard for helicopter pilots to fly. "This is worse than the Port Hills in terms of having to fly in smoke yesterday - the wind change meant most of the pilots were flying in heavy heavy smoke." A number of the pilots fighting the blaze also fought the 2017 Port Hill fires, Mr Beck says. "This one is devastating economically. Port Hills was a danger to the city. This is as bad as any fire I've seen in the States or Canada or Australia. "This is bad for little old New Zealand. This will be the biggest fire I think from a aerial point of view, 22 helicopters and hundreds of people on the ground." 9:40am- Newshub reporter Ed O'Driscoll says smoke from the fire is covering Nelson city. "We are continuing to manage cordons and prepare to assist with potential evacuations, should there be the need for these," Inspector Hooper says. There are currently thirteen cordons in place. Residents are advised regularly check the Civil Defence website and Facebook for updates and if there is the need to communicate urgently with residents a Civil Defence Alert will be sent. On Thursday night police asked people in the wider Wakefield area to be prepared and take precautionary measures to reduce the risk to property after the fire intensified yesterday afternoon. "As a further precautionary measure it has been decided that today early childhood centres, kindergartens and schools will be closed in Wakefield. "Police staff are dedicated to supporting the emergency response and continue to be patrol proactively in the wider areas affected by the fire," Inspector Hooper says. Residents will be provided with updates as soon as soon as possible. The investigation into the circumstances around the fire on Rabbit Island is continuing. Police are not aware of any further reports of drone activity after the report of a possible drone sighting yesterday morning. Police were deployed to the area and could not locate either a drone or an operator. "We would reinforce the message to the public that we do not want any drones being flown in and around the operational area of the fire. "Drones are a direct risk to the aircraft who are key in the firefighting response and protecting life and property," Inspector Hooper says. "We would like to thank the local community for their support during this difficult time when we are evacuating residents and sending out the warning of the possible need to evacuate. "We know this is a stressful time for the community and we want to reiterate that anybody who has medical or welfare needs to contact the relevant support agencies." 9:05am - The forestry industry has suspended all operations in the upper South Island. 9:02am - Civil Defence say if people are concerned they can self evacuate. 8:57am - Police say they are still investigating the cause of the Rabbit Island fire. People are advised not to fly drones in the area as emergency services fight to control the inferno. Police say they found no drone or drone controller on Thursday after they recieved a report of a possible sighting of a drone in the area. 8:45am - A welfare centre has been set up in Wakefield and Civil Defence is considering opening another one. 8:40am - Fire and Emergency New Zealand incident controller John Sutton says the fire has grown to 2000 hectares. Overnight the fire grew by approximately 200 hectares to a total perimeter of 2000 hectares. The immediate risk is in the south-east corner of the fire closest to Wakefield. Fire crews at the fire ground are snaring a crucial window of better weather ahead of an expected turn around at midday. Conditions are cooler with less wind on Friday morning, Mr Sutton says. Fire crews are braced for the pressure to rise again from midday with a northwesterly wind change. Wakefield residents are on alert for possible evacuation. If they do have to evacuated Civil Defence says residents will be alerted by text message. Smoke has hampered efforts to get access for some Redwood residents back to their homes. 8:30am - A media briefing about the fire is underway. 7:50am - Civil Defence has recommended all schools in the Wakefield area close today so that emergency services have better road access should an evacuation occur. "Fortunately wind changes mean that the risk of fire proceeding towards Wakefield has reduced overnight but predicted wind changes later in the day may change this situation." Civil Defence will be holding a press conference at 8:30am. 7:45am - Wakefield School has closed for the day on Civil Defence advice. "Civil Defence has advised us to close today as a precaution to avoid traffic congestion should they need to evacuate the village." 7:42am - Wakefield resident Robyn Jenner got emotional telling Newshub's Ed O'Driscoll that her son was helping to battle the blaze. She said the crews were doing a fantastic job, and last night she had packed a few bags in preparation in case she needs to evacuate her house. 7:02am - The fire in Tasman is still "largely uncontained", Newshub's Sam Farrell says, adding that Fire and Emergency NZ will give an update later in the day. 6:40am - A fire has now broken out up north. Three helicopters are heading to Northland to battle a quick-spreading scrub fire at Shipwreck Bay. Eleven crews have been stood down because conditions are too dangerous at the bay, which is 17km outside Kaitaia. 6:19am - Newshub's Sam Farrell said it's been a "sleepless night" for residents in Wakefield put on standby for evacuation. He said fire growth and ash on Thursday was the cause for unsettling authorities, but it hasn't amounted to any further evacuations yet. "We don't at the moment know just how big this fire is. The last update last night was that it was around 1600 hectares with perimeter of 23km." 6:10am - There are fears the hot and dry weather conditions in the Tasman region could spark more fires, and fire scientists Grant Pearce has warned the conditions are treacherous. "The lack of rainfall for the next month or so, that's worrying in terms of the potential in not only this part of the country - sort of Nelson and Marlborough - but in other parts of the country as well." The Tasman community has been rallying together to provide shelter for those forced to leave their homes, and the Red Cross has been helping with the transition. 6am - Gavin Newton, disaster management officer at the Red Cross, told Newshub a lot of the people have been "absorbed into the local community, or have managed to organise themselves with alternative accommodation". He said the Red Cross will provide support for people when they return home, and that the organisation is doing everything it can to help. On Thursday, approximately 25 properties were evacuated in Teapot Valley. Civil Defence called it a "precautionary measure because of the increased fire intensity we have seen this afternoon" due to increased wind and humidity. It came after reports that the flames had gotten worse in the afternoon. A Fire and Emergency NZ spokesperson told Newshub the flames had intensified, but that didn't necessarily mean the blaze had grown. That was before reports the fire had been reduced to 1600 hectares down from 1900 hectares on Thursday morning. 5am - Thousands of people in Wakefield are waiting to hear if they will have to evacuate their homes as the fire creeps closer. Newshub's Edward O'Driscoll said people in the Tasman town are on standby to flee their homes if the Pigeon Valley blaze spreads to their properties. "Residents in the Wakefield area have been told to secure their homes, bring in furniture from outside, and Civil Defence officials will later this morning work with Fire and Emergency to see if those evacuations need to take place." It's understood rest homes and high-needs residents in Wakefield have already been evacuated. The Nelson Tasman Emergency Management Group evacuation notice says any evacuation call "will be accompanied by another text alert for those residents with compatible smartphones". It tells people to "think seriously about what important documents, medicines or keepsakes you will need". Those wanting to self-evacuate have been asked to call Civil Defence: 03 543 8400. On Thursday it was confirmed by police that the Rabbit Island fire was suspicious and that an investigation into its cause was underway. Anyone with information has been asked to call 03 5453840. NIWA said fire investigators were "almost certain" the blaze near Nelson was caused by a spark from agricultural machinery being towed by a tractor. Meteorologist Ben Noll also said Tasman had two consecutive days of 33 degree weather, the warmest on record. Prime Minister Jacinda Ardern visited the scene on Thursday, where she told media she could see the fire was "significant" and Nelson was "dry as a bone" as she flew in. She also commented on police sightings of a drone in the area, and condemned the behaviour as "incredibly dangerous." "The message is simple. If you have a drone, putting it up right now is incredibly dangerous and inhibits the job that needs to be done here. The sky needs to be left open for helicopters and fire and emergency to do their job." The fire broke out near Nelson on Tuesday and around 400 people were evacuated from more than 182 properties. One property was destroyed, and a vet confirmed that more than 60 sheep had to be euthanized.